Probenecid forms part of gout agent. Probenecid is useful in reducing uric acid level to avoid any risk of damage to the renal. Probenecid is also useful in prevention of further attack of gout. 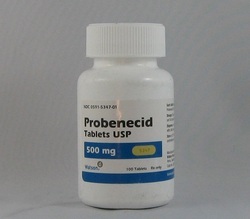 Probenecid will block the active transport of the uric acid which will decrease absorption of uric acid in the proximal tubule of the kidney. Probenecid may cause few side effects such as inhibition of renal excretion of NSAIDS and penicillin along with gastrointestinal discomfort.